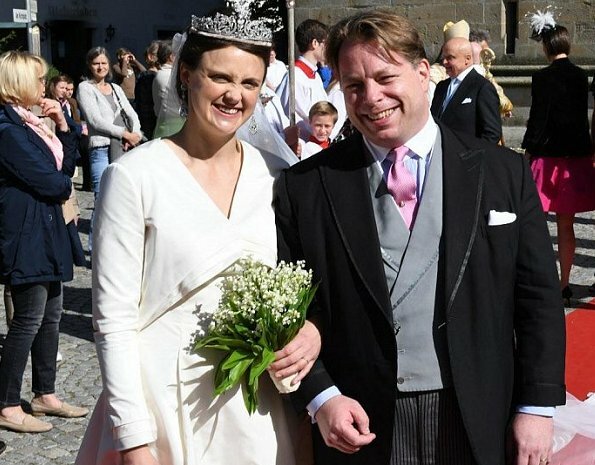 Anna Therese, Countess von und zu Arco-Zinneberg got married to New Yorker Colin McKenzie with a church ceremony held at Basilika Niederalteich on Saturday. 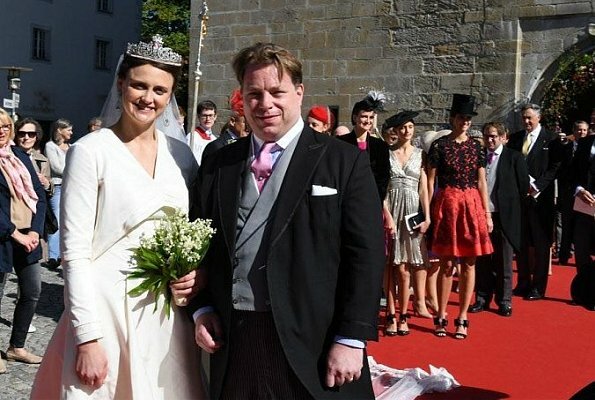 Among nearly 400 guests who attended the wedding ceremony, there were Grand Duchess Maria Teresa of Luxembourg, Belgian Princess Astrid and her husband Prince Lorenz. Countess Anne Therese von Arco-Zinneberg is the daughter of Archduchess Maria Beatrice of Austria and her husband Count Riprand of Arco-Zinneberg. The family owns Arcobräu beer factory in Moos and also the Moos Castle. the tiara is beautiful, the dress too, but I have no idea what to do with this cape..
Best wishes to the newly wed. Regarding the fashion blog comments, I am not impressed neither by GD Maria Teresa nor by Pr Astrid, it is nothing to remember about. I don't like her wedding dress. And I think it's not flattering... Isn't she the sister of Olympia "fiancée" of prince Napoléon? Oh, it was a very strange wedding dress. Not so nice with the flaps at the front. The tiara looks ill fitting at her head, too wide or something. The grand duchess dress seems to be a size too small. No good fashion day! That tiara looks so poorly placed, like she only quickly plonked it on her head. Doesn´t do it justice. The wedding gown looks divine from behind. Less so from the front. Weird flaps over her chest, or is it a strangely cut jacket? On a different note - is a top hat now a thing for ladies? I don´t think I´ve seen ladies wear them (other than equestrians). The woman with the top hat looks ridiculous. Fashion-wise, everybody's attire, including the bride's, was a flop. The bunch of them look like peasants wearing their Sunday's best. The tiara is beautiful its just really badly placed with a hairstyle that simply does not work. My goodness, it is sure a collection of strange outfits at this wedding. 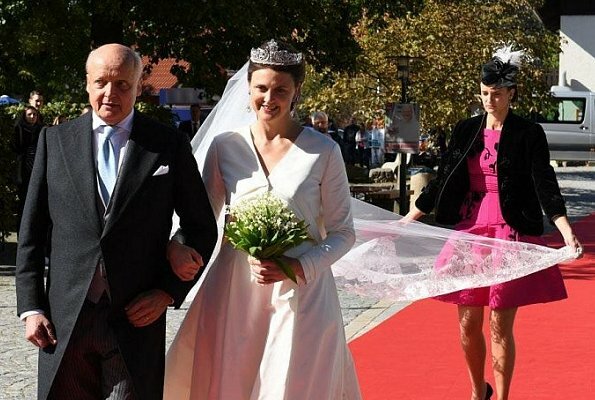 The wedding dress lacks a happy touch of something pretty, the young women in the too-short dresses, odd shoes and weird top hats look silly and the GD Maria Teresa and Princess Astrid are disappointing. how wonderful a nother Royal Wedding. I wish there was a guestlist. The Bride and Groom are a very lovely couple. Very nice Tiara and dress.GD Maria Teresa's green dress looks OK but nothing very special. Maria Teresa’s dress is so beautiful I’m going to copy it. 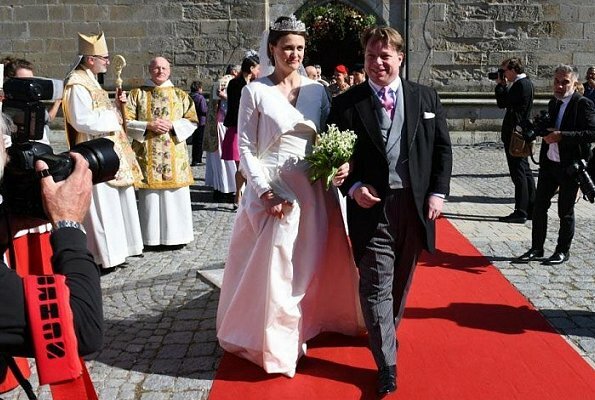 The flaps on the bride’s dress are part of a coat that was taken off at the wedding party. What is it on Princess Astrids head?? A hat?? Maria Teresa brilla, muy guapa de verde, entre tantas damas con sombreros ridículos y vestidas como para una boda cateta. El vestido de la novia es uno de los menos favorecedores que he visto en mi vida y la tiara se la han colocado de cualquier manera. Maria Teresa gets more beautiful as she gets older. The bride's hairstyle was too simple for this grand tiara, and tiara's placement wasn't the best, imho. 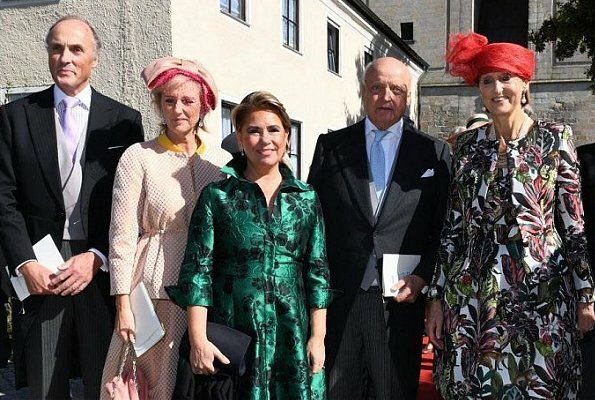 Nice group photo, but what is Adss Astrid wearing on her head some flat bow and the other Lady red hat. Oh well to each it's own. Hmmm again on these ‘removed’ and somewhat pretentious nobility weddings. I can’t say that there’s anyone looking classy here. Trying hard to look ‘modern’ whilst still ‘traditional’. In the end it’s just poor taste fussy. That top hat outfit is the perfect example of ‘cheap but trying hard to not show it’ concept. Too bad.